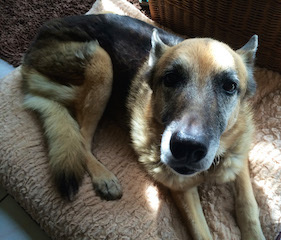 There are few things on this earth as sweet and loving as a senior GSD. How would I know? In June of this year, I said goodbye to Greta, who lived a very full 14.5 years with me, from 3.5 months of age. The closer the end approached, the more beautiful, wise and tender she seemed to become. But she also suffered progressive muscle degeneration and arthritis, needed help getting up and going outside, needed frequent cleaning and was rapidly losing her eyesight. Watching a beloved dog age isn’t pretty and it isn’t for the faint of heart, but after providing you with [her] lifetime of love, companionship and loyalty, you owe it to your senior to care for her the best you can, for as long as you can. It’s important to recognize the at-first subtle changes in your aging GSD so that you can develop action plans with your veterinarian, groomer, day care provider or trainer to keep her as happy and comfortable as possible as the signs progress. Shepherds thrive on activity and interaction. Continue those daily walks, adjusting the duration and pace for your GSD’s ability as she ages. Swimming is a great low-impact activity for any dog, especially seniors, as it relieves pressure off sore and swollen joints. Teach her a new trick—the mental stimulation and interaction and positive reinforcement from you will make her very happy. Anything that keeps your GSD mentally and physically agile (within reason) can help prolong quality of life. Also, as you notice your GSD slowing down, reassess her diet. In general, senior foods tend to be more digestible and nutrient dense to compensate for the senior dog’s decreased ability to absorb and metabolize nutrients. She might require less food or at greater intervals or both, and including high-quality joint and muscle health supplementation daily is important. Age requires a special kind of care for your GSD, just as when she was a puppy. Each walk, each cuddle session, each every day interaction takes on special meaning. Make the most of it.